Scottsville, VA, April 10 - The town from which I am writing is not quite as old as Jamestown nor yet as old as Hampton or Yorktown, but all the same is not a young town. Scottsville is one of the old-time canal towns, and it has a history that is very interesting, a 'way back yonder' history, and if I were a romancer of the Frank Carpenter variety I might use up several columns of space telling about the ancient glory of Scottsville, but I am here to talk about Scottsville of to-day and more especially of Scottsville of the future. Nevertheless, there is not a little interest in the story of the old-time Scottsville, and I am sorely tempted to say something of it. In the old days when the Virginia and Kanawha Canal was the best transportation line that Virginia could boast of, Scottsville was a town of vast importance and was the shipping point for a territory that extended from the upper James River country away back to the mountains of what is now West Virginia. It was then the shipping point for Albemarle, Buckingham, Fluvanna, Augusta, Rockbridge, Appomatox, Prince Edward, and a number of other counties. In those old days all of the products of the rich counties named were wagoned to Scottsville and shipped hence by canal to Richmond and from Richmond by sailing vessels to the uttermost parts of the commercial world. Scottsville was then a commercial centre that was not to be sneezed at, and it did not ask any odds of Richmond or any other town, but railways came along and played thunder with things in general and with Scottsville in particular and with canal towns specifically. The building of the Virginia Central Railway, now known as the main line of the Chesapeake and Ohio, was the first blow that knocked Scottsville in the middle of next week. That cut-off from this town the big wagon trade that had been formally coming from the counties to the west. Other railway enterprises coming along in rapid succession curtailed the canal business and Scottsville lost trade and importance accordingly for it depended almost entirely on the canal for its commerce. However, the town struggled along and kept up a pretty good front until war times. Specific between the days of '61 and '65 when General Phil Sheridan made a raid through this splendid farming section and carrying out the orders he had received from the infamous fellow in Washington, named Stanton, he tried to see to it that crows passing this way would have to bring their rations along with them or starve. Sheridan crossed the James here, building pontoons in the beautiful horseshoe bend, and as soon as he got across he applied the torch and burned up everything in Scottsville that would burn. However, there were in and about the town a lot of old brick houses that were built in the early days of the nineteenth century, and they being fireproof refused to succumb to Sheridan's torch. These houses still stand and they mark Scottsville as something of a unique town. I spent last night in one of these old houses, said to be more than 100 years old. I am sure it is every day of it, and I am also sure that no repairs have been made on it since it was built, and I doubt if as many as a half a dozen brooms have been worn out in the sweeping of same since the day it was completed. But this is not a representative house, not by any means. The next blow that came to Scottsville was the building of the railway on the towpath of the old canal. That made the town only a country station, and so it remained for a long time, and so it might remain world without end if the old fogies could have their way; but luckily a new generation has sprung up, young blood has come to the front, and these youngsters, having read about flourishing inland towns elsewhere, and having taken an inventory of the raw material in and about Scottsville, have reached the conclusion that this is no good reason why wood-working factories, overall factories, cotton mills, saw mills, tobacco factories, creameries, canneries, and other factories may not prosper here as well as in other Southern towns. I have spent two days looking into conditions, and I am of the same opinion. Scottsville is geographically situated so as to command a good trade from all of Virginia and the south if it will make the goods that Virginia and all of the South may want, and there is no reason why it should not, for the raw material is here, and here in abundance. Not only that, but there is here a good lot of local capital, in the hands of men who are ready to invest it in any good manufacturing enterprise that may be headed by a man or men who have the experience and a little of the capital. This statement is made advisedly, and simply means that Scottsville people have faith in their town and the back country surrounding it, and they are ready to take "pot luck" with anybody who knows how to make up the raw material to be found here in great abundance. They have some money, but are lacking in experience, and they are ready to learn. Scottsville is a pretty good town as it is, and considering the many setbacks it has had in one way and another, it is a marvel in that it has held its own. The town has two banks, two hotels, a number of retail stores, a cattle and horse market, a large tobacco interest, and the educational and religious and social advantages are equal to those of any town in the State. The Scottsville National Bank, which was established in 1901, has a paid up capital of $25,000, a surplus of something like $11,000, and undivided profit amounting to more than $2,500. The deposits are close to $100,000, and the loans and discounts are beyond $75,000. The bank has a building that is valued at about $6,000. The Fidelity Bank is a private concern that is under the management of Jacinto V. Pereira, one of the best business men of the town. Mr. Pereira came to this country from his native England in 1877, and after varied experiences in several parts of Virginia and the south, located in Scottsville. He has the confidence of the people, as is evidenced by the fact that he is a member of the Council and is regarded as one of the best and most reliable of the city fathers. Scottsville is located partly in the good county of Albemarle and partly in old Fluvanna, the county line passing right through the town. The town's most valuable asset is the $30,000 iron bridge that spans the James River across the famous Horse Shoe Bend, and thus brings the town the trade of southern half of Buckingham County, a trade that in former years, before the bridge was built, went to Farmville and other towns. There are in Scottsville about fifteen stores of one kind and another, some of them being large establishments that do not a little of a wholesale business. I could not get the exact figures, but as well as I can calculate I would say that the mercantile business of the town comes very close to a half a million dollar mark in a year. The merchants have more than the half of Buckingham and a goodly part of Fluvanna to deal with. Good roads, perhaps the best in all of the State of Virginia, radiate from Scottsville into the interior of Albemarle county, and these perfect roads going over the mountain ranges and through the valleys are a goodly paying asset that Scottsville is justly proud of. Among the industries that are in full bloom in the town may be mentioned a broom factory that employees about a dozen hands nearly all of the year round, and a tobacco factory operated by Pitts & Martin. The factory is only a leaf establishment and was put into operation less than a year ago. The most of the weed that finds its way to this market comes from the good old county of Buckingham and is made up largely of the black goods that finally finds its way to the "Regie" buyers in Richmond. The Pitts-Martin concern buys direct from the farmers and have within the past year made Scottsville a market that figures largely in the tobacco problem, and they propose to make a greater market here. A loose leaf warehouse would pay well here, and the right man who knows how to run a warehouse can and will find a good job here. A goodly quantity of the sun-cured stock was handled in Scottsville during the season that has just closed, and the Pitts-Martin concern paid as high as $10 per 100 for some of the sun-cured wrappers that came this way. Messrs. Pitts & Martin handled more than 300,000 pounds of the weed this season, and they did not commence operations until the season had been far advanced. The back country that surrounds Scottsville is unquestionably the best farming region of Virginia, the choicest of the fruit and vegetable growing region of Albemarle and Buckingham and Fluvanna counties. In these regions, corn and wheat and oats grow to perfection, tobacco of various grades made the money crop, and the mountains and the valleys bring the best of fruits and vegetables. The farm lands over the James are the best vegetable grounds to be found in the State, and a cannery in this town would find all the raw material in the shape of tomatoes, beans, corn and fruits it would require. The timbers in the country surrounding Scottsville would keep a dozen or more wood-working establishments busy all the year 'round. The old field white pine is here in abundance, and the forests covered with the same would furnish box shook factories and stave factories with material for many years to come, and the tops and laps of the pine trees would make the heart of the excelsior maker glad every day in the year. In addition, the manufacturers would find here all the cheap labor he is looking for. In short, I know of no location in Virginia that is more enticing to the manufacturer, the man who is looking for raw material and the cheap labor in juxtaposition. The creeks that run down the mountain sides and empty into the James River, if converted into electric power, would furnish all the motive power needed to run any kind of a factory. The abundant supply of pine, oak, hickory, poplar, dogwood and other timbers makes Scottsville an ideal place for wood-working plants of any and all descriptions. The splendid fields, upon which roam cattle of the finest kind, make this an interesting place for the creamery man. The milk can be had, and the town being equidistant between Richmond and Lynchburg, no better shipping point for a creamery or an ice factory can be found on the Virginia map. Scottsville offers special advantages in a social, educational, and religious way. One of the bet high schools in the State is located here, and there are five churches in the town. These facts, together with the further fact that the town is well governed, is peaceably and orderly, the streets are well paved and there are more than 1,200 yards of the first-class sidewalks, make it a goodly place to live in. Another interesting fact is that there are no town taxes levied on the people and no license taxes for the privilege of doing business here. This fact is explained by the statement that Scottsville has a well-regulated and entirely orderly dispensary, which pays all of the paving expenses, all of the school charges, and a whole lot of other charges that people in some other towns are taxed for, and the beauty of it all is that the receipts and the profits from the dispensary come out of the pockets of wayfarers and the visitors within the gates. A few miles out from the town is a magnificent silica mine, which is owned by Jackson Beale. An expert, who has recently taken a view of this mine, declares that the stone from it runs 98 per cent pure silica, and is therefore a superb material for the manufacture of plate-glass. A Western plate-glass maker has just been here to examine the mine and has made the owners an offer for the raw material to be shipped to his factory in the West. The owner may accept the offer for it is like picking up dollars in the road, but I have been asking myself the question if this stone is good to make plate glass, and if the Western concern can afford to pay the freight on the raw material, why not have a plate-glass factory in Virginia and right here at Scottsville. There is something in this for Richmond capitalists to think about. I said above that Scottsville is an old-time town, and here it is: but there is some young blood here, and that young blood has come to the conclusion that with the abundance of raw material hereabouts there can be no good reason why Scottsville shall not become one of the livest of the inland manufacturing towns of Virginia, and they are very much determined to make it so. Some of these young men have capital to invest, and they are ready to take pot luck with capitalists from the outside who want to establish wood-working plants, brick-making plants, shirt factories, overall factories, excelsior factories, milling enterprises or what not. Scottsville is a good town for any of those things, and I believe they would pay here. Certainly the home people think so, and they are ready, willing, and anxious to put their money in them. 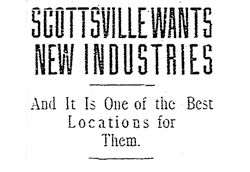 Scottsville Wants New Industries, 11 April 1909.